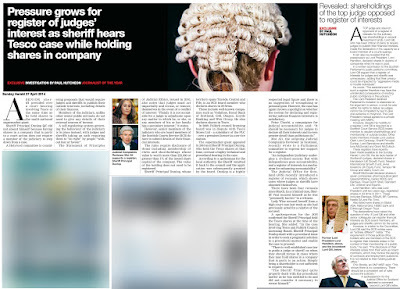 US justices base their careers on corporate funds – Lord Gill. DURING a meeting at the Scottish Parliament almost one year ago, Scotland’s former Lord President & Lord Justice General launched a scathing attack on the judiciary of the United States of America, accusing top US judges of harbouring financial ties to corporations & vested interests – in order to ensure their election to judicial office. The damning accusations against top US Justices – aired in an open session of the Scottish Parliament by Scotland’s longest serving judge - Lord Brian Gill (74) – were not in response to an international incident or some complicated round of diplomacy and trade negotiations. Rather, Brian Gill’s pulverising attack on the integrity of the judiciary of the United States - looked upon by many as the world’s most powerful democracy – were in response to a proposal for Scottish judges to register their interests – in the very same way judges in the United States and other international jurisdictions are required to register their interests. 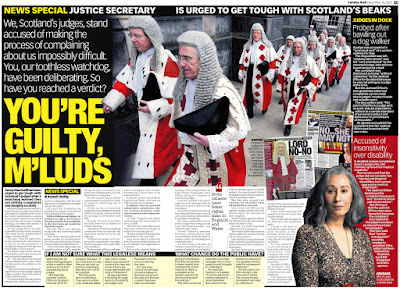 Judicial Transparency, US style, or for that – judicial transparency from any other jurisdiction, was not welcome in Scotland - according to Lord Gill. And Gill was the expert. 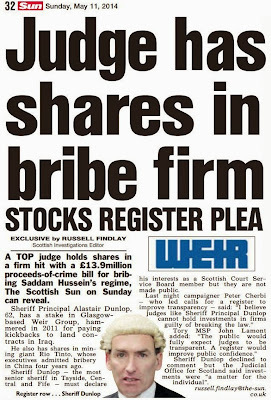 For as one of the shortest term serving Lord Presidents’ of modern times – he spent much of his three year term battling against proposals to require Scotland’s elite, secretive judiciary to declare their significant wealth and connections to the professions & big business as called for in Petition PE1458: Register of Interests for members of Scotland's judiciary. However, worse was to come from the notoriously anti-transparency judge, who once threatened to deny journalists access to court documents. 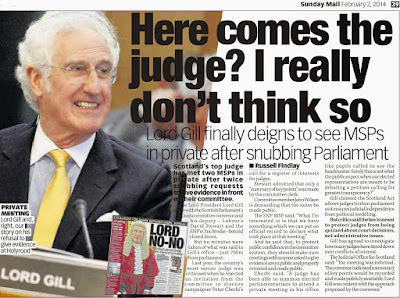 Lord Gill – who has since relocated to a posh seat on the UK Supreme Court based in London - was not content with lambasting US justices he accused of cuddling up to corporations for campaign cash. In response to further questions from the Petitions Committee, Lord Gill opened up another sneering line of attack on US judges, castigating the highly valued nomination hearings of US Supreme Court justices which form a key part of the judicial process in America and are widely available to watch online, with examples such as the nomination process for famed Supreme Court justice Ruth Bader Ginsburg. 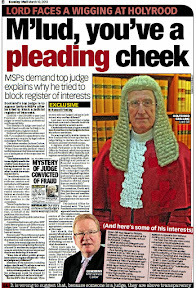 However, only weeks before Gill made his outburst against the judicial selection process in the United States, the behind closed doors approach to selecting Scottish judges – who dodge questions on their own ties to vested interests inside and outside the legal profession, was revealed in a media investigation here: TO PLAY THE PRESIDENT: Transparency, diversity & judicial reform on the cards as hunt begins for Scotland’s next top judge & Lord President of the Court of Session. 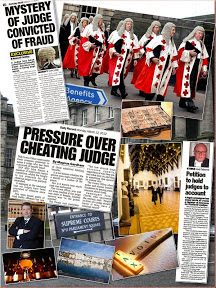 And, investigations by DOI revealed Scotland’s judiciary are themselves, no stranger to financial ties to vested interests and big banks, reported in further detail here: JUDICIAL RICH LIST: Register reveals top judges investments in dodgy justice system providers, companies linked to international bribes scandals and here: COURT BANKING, M’LORD: ‘Unworkable’ register of judicial interests reveals top judges’ financial links to world of big money, insurance giants, vested interests. No one would ever claim the US justice system, or any justice system was perfect. It is true, US justices do have links to corporations, and regular coverage appears in the media. However at least in the United States and other international jurisdictions where registers of interests are required of the judiciary, court users, elected politicians, the media and public have the opportunity by right of law and expectation of transparency - to inspect their judiciary on a much more detailed level than in Scotland. And, this is what makes the difference. Transparency. An altogether simple case to present. Nothing more complicated than openness itself. Beware then, those who answer questions on transparency with hand gestures, demands on how to frame the questions being put to them, or using an underlying tone of aggression. 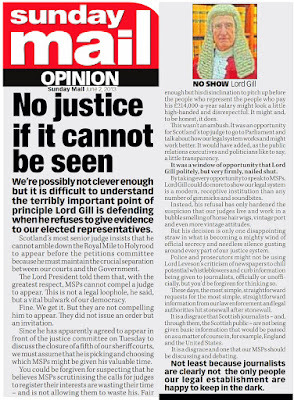 Video footage of Lord Gill’s meticulous, if short derision of judicial colleagues in the United States made clear the former Lord President’s opinion of judges who are required by law and due process to follow a path more transparent than his, and his colleagues within the Judiciary of Scotland. 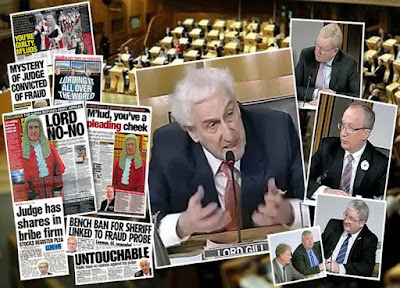 The full evidence session held at the Scottish Parliament with Lord Gill on 7 November 2015 can be viewed here: Evidence of Lord Gill before the Scottish Parliament 10 November 2015 with a full report and transcript of the meeting here: JUDGE ANOTHER DAY: Sparks fly as top judge demands MSPs close investigation on judges’ secret wealth & interests. 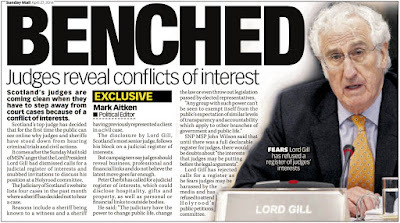 In between refusing to give evidence to the Scottish Parliament, Lord Brian Gill spent his time on international travel, and giving a lecture on judicial ethics while on a taxpayer funded state visit to Qatar – a country not known as a haven of transparency or human rights. 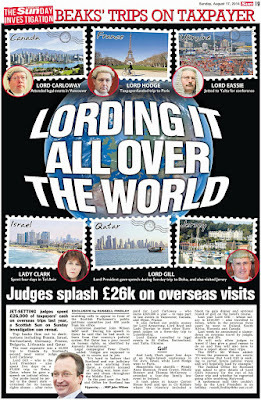 Lord Gill’s Qatar expedition funded by public cash is reported in further detail here: LORD JET SET: Scotland’s top judge Lord Gill takes 5 day STATE VISIT to Qatar as investigation reveals judiciary's international travel junkets spree. 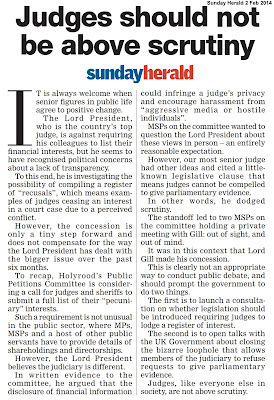 A year on from the confrontation between Lord Gill and the Scottish Parliament – only after two refusals to give evidence – MSPs await to hear from Scotland’s current top judge Lord Carloway – who, like his predecessor, given an equally hostile opinion on the very notion of judicial transparency and requirements of judges to declare their interests. 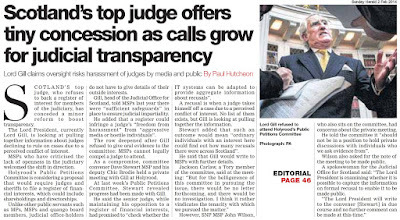 A recent report on Lord Carloway’s opposition to judicial transparency can be found here: Top judge Lord Carloway hits out at judicial interests register proposal. 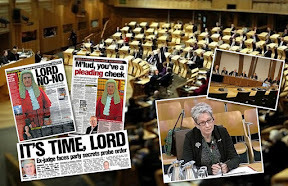 The proposals before the Scottish Parliament received cross party backing from MSPs during a full debate at Holyrood during October 2014 - Debating the Judges - call for the creation of a publicly available register of judicial interests containing information on judges backgrounds, their personal wealth, undeclared earnings, business & family connections inside & outside of the legal profession, offshore investments, hospitality, details on recusals and other information routinely lodged in registers of interest across all walks of public life in the UK and around the world. Ireland’s Parliament to hear motion calling for judges’ register. THE REPUBLIC of Ireland’s Parliament – the upper house Seanad of the Houses of the Oireachtas – will be the setting for a motion calling for Ireland’s judiciary to be subject to a full register of interests, similar in nature to widely backed proposals currently being investigated by the Scottish Parliament - Petition PE1458: Register of Interests for members of Scotland's judiciary. The Irish Times recently reported on moves to create more judicial transparency in Ireland, led by independent Senator Victor Boyhan – who intends to table a motion calling for the introduction of a register of judges’ interests to “foster a culture of openness and transparency”as well as confidence - in the judiciary. At present in Ireland, as is in Scotland, there is no requirement for members of the judiciary to declare their interests. Court users in Ireland must, like those in Scotland, rely on a system of archaic oaths written by the judiciary - where judges promise [themselves] to execute their office “without fear or favour, affection or ill-will towards any man”. 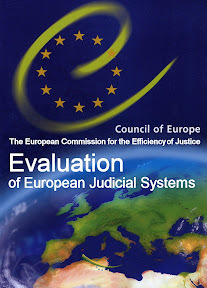 The proposal by Senator Boyhan - to increase judicial transparency in the Republic of Ireland come after Ireland’s top judge - Chief Justice Mrs Justice Susan Denham - recommended the establishment of a judicial council – first suggested by the Committee on Judicial Conduct and Ethics in 2000. The creation of such a council for Ireland, would be similar to the ruling Scottish Court & Tribunal Service Board – the powerful judge-led legal vested interests quango which controls Scotland's courts and must approve all policy or changes in relation to how courts and tribunals function. Proposals currently on the table envisage the membership of any newly created ‘Judicial Council’ in the Republic of Ireland would consist of the Chief Justice and ordinary judges of the Supreme Court; and the Presidents of the High Court, Circuit Court and District Court and ordinary judges of those courts. The Judicial Council will be tasked to “develop a code of conduct for judges, as well as oversee and support their training and develop a complaint structure for litigants” and promote “excellence in the exercise by judges of their judicial functions”. Speaking to the Irish Times, Senator Boyhan said the Government should introduce such a council, as well as a judicial appointments commission, promised in the programme for government, and intended to reform the selection of judges. He called for a consultation process to begin with the judiciary on the establishment of a register of interests for judges. 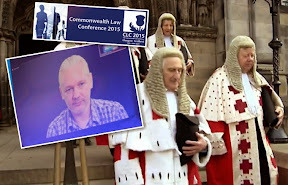 “I, personally, would be uncomfortable if a judge was a member of a Masonic lodge, for example, or other secret society, and I think that should be declared, as should shares in financial institutions,” he said. 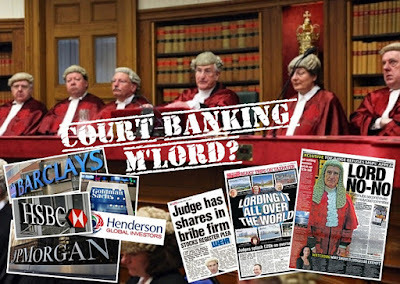 Mr Boyhan said, in the UK, judges have been found to have conflicts of interest in some cases. 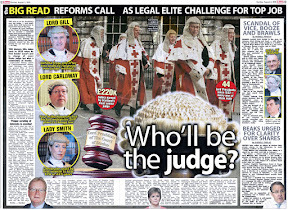 A report by Diary of Injustice last week revealed links between Scotland’s current top judge – Lord Carloway – who opposes a judicial transparency register – and members of Ireland’s judiciary. A programme for the visit also revealed Lord Carloway met up with two senior Irish judges in a Chinese restaurant to discuss the ‘efficiencies of courts’. And a powerful editorial in The Sunday Times newspaper of 28 June 2015, supports the creation of a register of judicial interests in the Republic of Ireland. The editorial states: “Ireland, as a nation, is a great deal more sceptical than it used to be, hardened by corruption in the body politic, irresponsible behaviour on the part of banks, and appalling revelations of sexual abuse in the Catholic church. There are a few professions, however, whose reputations have emerged largely unscathed from the non-stop diet of negative news engulfing the country for the past decade. The medical profession, teachers and professors consistently score highly with the public. So does the judiciary, and that is why potential conflicts of interest involving judges is an important issue. Within it’s editorial, the Sunday Times - a powerful supporter of transparency alluded to further evidence access international jurisdictions - where asset declaring registers for judges already exist. The editorial continued: “We cannot think of a single reason why judges should not be required to sign up to a register of interests in the same way that elected politicians must make public their interests through the Standards in Public Office Commission. Indeed, Ireland is a laggard in this regard. Of 137 jurisdictions surveyed by the World Bank, almost 58% had asset-declaration regimes in place for all levels of judges and prosecutors. Judges, quite rightly, are independent of the executive, so any system of asset declaration would most likely be self-regulating. So long as a register was transparent, robust and available for scrutiny by the public, this should not be an issue. 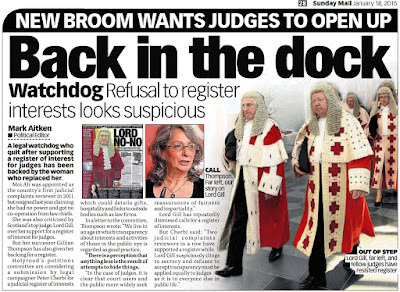 Scotland’s top judge – Lord President Lord Carloway has been invited to appear before the Scottish Parliament to face questions on his opposition to proposals requiring the judiciary to declare their interests. 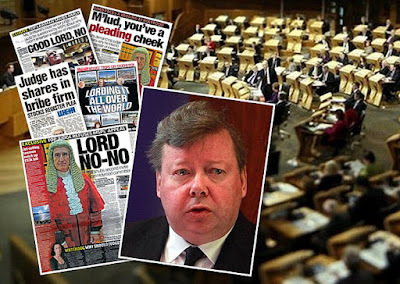 The invitation to Lord Carloway has been issued by the Scottish Parliament’s Public Petitions Committee - who are conducting a four year investigation on a proposal calling for judges to be required to declare their vast and varied interests including their backgrounds, personal wealth, undeclared earnings, business & family connections inside & outside of the legal profession, membership of organisations, property and land interests, offshore investments, hospitality, details on recusals and other information routinely lodged in registers of interest across all walks of public life in the UK and around the world. Fund lawyers like nurses & public services - say lawyers. DURING TIMES of financial crisis, Brexit woes and growing demands on nurses, doctors, the NHS, Police, education and everything else. public services should be forced to take an equal seat to the spiralling billions of pounds of public cash lavished on lawyers, the courts and legal aid – according to claims from the legal profession. 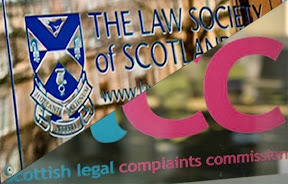 The demand for equal treatment to public cash comes from the Law Society of Scotland and the Faculty of Advocates – who, along with other legal vested interests - are calling for the state to fund all court actions and treat lawyers in the same ‘deserving of public funds’ category as medical care provided by the National Health Service, education, social care and Police. 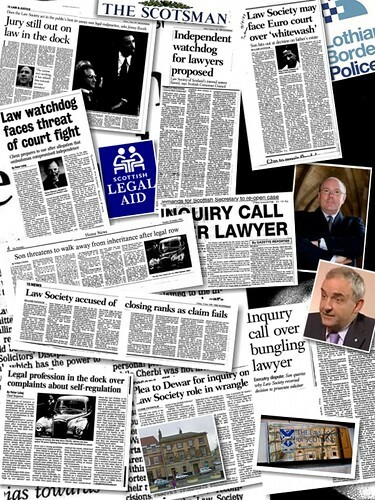 The latest call from the Law Society of Scotland to increase - by millions more - the flow of public cash into legal business and struggling lawyers pockets - comes in answer to plans by the Scottish Government to hike court fees by up to 25% and turn the closed shop, secretive, slow and unjustly expensive Scottish courts run by the Scottish Courts and Tribunals Service (SCTS) into a self funding operation. The Law Society also claims that a proposal to introduce a 24% rise in court fees would be ‘unjust and unjustifiable’. 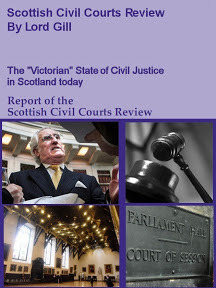 The Law Society has said that any new system for court fees would have to ensure they were proportionate, taking into account Lord Gill’s Review of the Scottish Civil Courts, and the findings of Sheriff Taylor in his Review of Expenses and Funding of Civil Litigation in Scotland. Mr Smith said: “We think the focus of any review of court fees should be on redressing the balance between claimants and defenders in personal injury cases. However if the government’s aim is to have a system where 100% of the cost of the courts are covered by fees paid by those involved in the actions lodged, it will be vital to have proportionate fee levels. “The consultation option to introduce a 24% rise in court fees would represent an unjust and unjustifiable increase which would create a very real barrier to access to justice for claimants especially vulnerable people who have suffered life changing personal injuries. 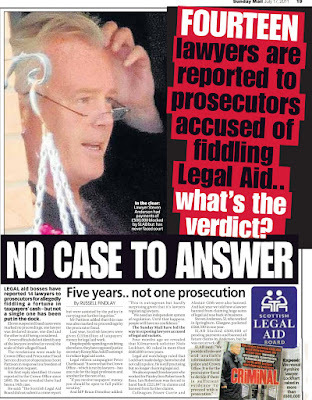 Going a little further, and backing up their legal vested interest colleagues, the Faculty of Advocates response to the Court Fees consultation claims democracy could not function if the state did not pay for litigants to sue everyone under the sun in the same way convicted mass murderers and fraudsters empty hundreds of millions of pounds of Criminal legal aid from the public purse. “As a matter of principle, the civil justice system should be funded by the state, not litigants,” it said. “The civil justice system is a cornerstone of a democratic state. It is the duty of the state to provide an accessible civil justice system…To the benefit of society at large, the law is made, declared or clarified daily by the civil courts. The civil justice system is vital to every citizen, whether or not he or she ever becomes a litigant. The benefits to society justify it being funded in full from general taxation. “Many state-provided services are funded from general revenue, on the basis that these services benefit the whole of society, and not just those in immediate need of them. Our society accepts that, without regard to their means to pay, individuals should have access to medical care, and that every sort of person should be served by the police and emergency services. The Faculty believed that the proposed increases would be likely to impede access to justice, and that requiring a person to pay expensive court fees could be a breach of Article 6 of the European Convention on Human Rights, which protects access to a court. “The funding of the civil justice system by litigants rather than the state does not protect access to justice, it hinders it. “If even a few people are deterred from litigating a good claim or defence, that is seriously damaging justice. There may be many more than a few who are so deterred, of course,” said the Faculty. So, the next time you need emergency medical care, the Police, education for your children, help with homelessness or any other public service - remember not to call the well trained and dedicated people who staff these vital arteries of life. 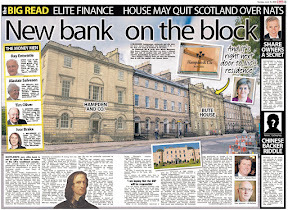 Instead, call a lawyer and insist your taxes, your hard earned savings (if any) and dwindling assets are handed over to fund a solicitor, court clerks, a struggling Sheriff on £160K a year or a £230K a year Court of Session judge – just like the Law Society of Scotland said – because you know – lawyers have your interests and ‘access to justice’ as their priority. 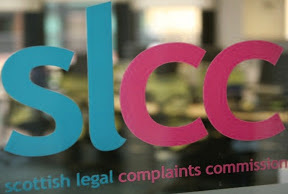 GIVE CROWN OFFICE MORE MONEY – Law Society to MSPs. 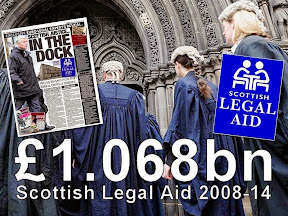 In a second take on the more public cash for lawyers approach, earlier this week the Law Society of Scotland also demanded more public cash be given to the struggling Crown Office & Procurator Fiscal Service (COPFS) – who are forced to eek out an existence on a staggering £112 million a year. 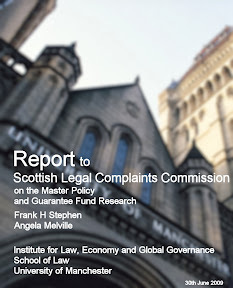 In written evidence to a Scottish Parliament Justice Committee inquiry into the workings of Scotland’s “Institutionally corrupt” Crown Office, the Law Society of Scotland has said that consideration will be needed to ensure that the service provided by Crown Office and Procurator Fiscal Service (COPFS) and others is accessible and inclusive for all members of society. In its response to an Inquiry on the role and purpose of the COPFS, the Society also stated that all participants involved in the criminal justice system have responded to a number of reforms during a time of significant financial pressure. Ian Cruickshank, convener of the Law Society of Scotland Criminal Law Committee, said: “It’s important that the criminal justice system evolves and makes use of new technology which can help improve the service particularly when there continues to be financial pressures alongside increasing numbers of serious crime reported to the COPFS and legislative developments. “However it is important to be aware of the potential impact on core services at a local level and on access to justice. There will need to be careful consideration on how best to ensure the service provided by the COPFS and others within the criminal justice system is accessible and inclusive to all member of society. Court staff add second judge to Ireland judicial junket. 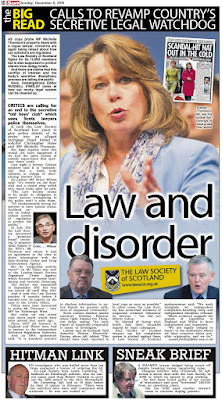 THE SECOND most powerful judge in Scotland - Lady Dorrian - the first ever female judge serving as Lord Justice Clerk, has been added to a 2014 judicial junket to Dublin - in which court staff initially claimed was solely attended by Scotland’s current Lord President - Lord Carloway. And, new details since released for the ‘fact finding’ judicial junket - also reveal Lord Carloway met two Irish senior judges in a Chinese restaurant - to discuss ‘efficiencies in the courts’. 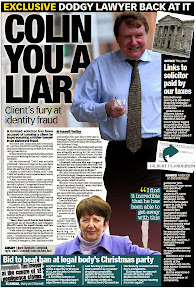 The addition of Lady Dorrian to Lord Carloway’s ‘fact finding’ trip only came about after the Scottish Information Commissioner (SIC) became involved in a dispute over the determined efforts of the Judiciary of Scotland and Scottish Courts and Tribunals Service (SCTS) to conceal details, destinations and the costs of UK & judicial overseas travel junkets from Freedom of Information enquiries. 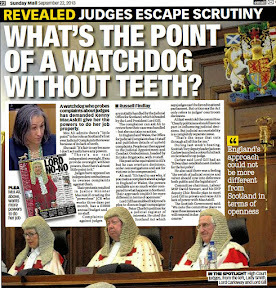 In October 2014, DOI reported that an investigation by the Information Commissioner received evidence court officials hurriedly switched the travel destinations of Scotland’s second most powerful judge – the Lord Justice Clerk Lord Carloway, after journalists queried an FOI disclosure, asking for further details of a journey. 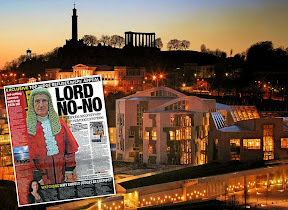 Lord Carloway – who was at the time Lord Justice Clerk and has since been elevated to the top post of Lord President earning £222,862.00 a year, was listed in a 2014 FOI disclosure by the Scottish Court Service: Overseas Travel of Scotland’s Judges 2013-2014 as having taken three taxpayer funded trips – a six day trip to Vancouver, Canada costing £5,820.16, a two day trip to Dijon, France, with a claimed cost of £59.15 and a two day trip initially listed as Evidence & Procedure Review Study Visit costing £232.93. 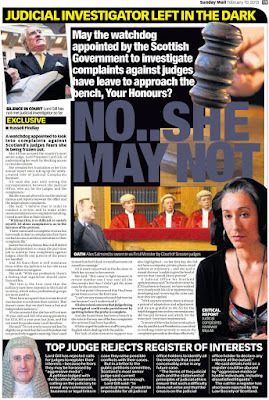 When journalists again contacted the Scottish Court Service asking why one domestic UK trip had seemingly been disclosed when court officials claimed it was too expensive to publish the UK only trips, the same official replied “I queried this with the Judicial Office for Scotland who have asked me to pass on their apologies. Lord Carloway actually attended the event in Dublin and not in Bristol. The switch of Lord Carloway’s destination during a trip taken in March 2014 – from Bristol to Dublin only came about after court staff realised they had previously claimed to journalists, and more recently to the Scottish Information Commissioner, the SCS did not hold data on judges trips inside the UK. 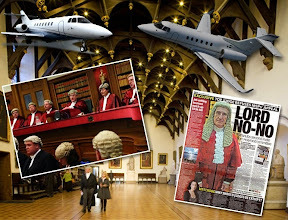 The ‘omission’ of Lady Dorrian from initial documents released in 2014 was blamed by court staff on murky arrangements for judicial air travel which allowed judges to book air tickets at public expense at their own discretion. 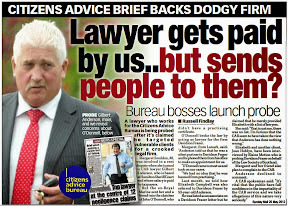 However, claims by the Judicial Office that new travel rules introduced by former Lord President Lord Brian Gill put an end to judges helping themselves to tens of thousands of pounds of air flights and trips have since been proved wrong - after continuing investigations revealed further international air junkets, reported here: LORDING IT MORE OPENLY: Scotland’s obsessively secretive judiciary reveal overseas junkets. 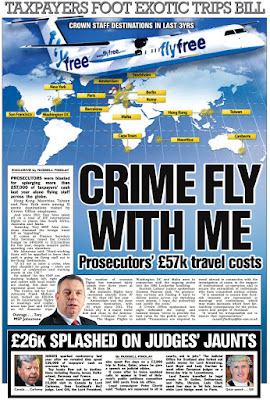 The latest crop of jet set junkets for judges reinforce suspicions highly paid Scottish judges on up to £220K a year are spending more time in the air and abroad, than attending to their judicial duties in the courts. Asked to confirm which trip was not booked by the judicial office – Lady Dorrian or Lord Carloway (or both), a spokesperson for the Judicial Office said: “Both. To be clear‎ the costs of the trip (flights, hotel) for both Lady Dorrian and Lord Carloway did not come out of the Judicial Office budget. The costs associated with travel and subsistence do. Therefore we knew about Lord Carloway's trip but incorrectly recorded that information. A programme for the visit, issued after the addition of Lady Dorrian to the trip, reveals Lord Carloway met up with two senior Irish judges in a Chinese takeaway to discuss the efficiencies of courts. An entry in the programme for Tuesday 25 March 2014 states: 7:30pm - Meeting with The Hon. Mr. Justice Peter Charleton and His Honour Judge Tony Hunt to discuss “The Working Group to Identify and Report on Efficiencies in the Criminal Justice System of the Courts” Venue: Good World Chinese Restaurant, 18 South Great Georges Street, Dublin 2. However, Lady Dorrian’s name does not appear anywhere in the issued documents for the trip to Dublin. 19.30p.m. Meeting with The Hon. Mr. Justice Peter Charleton and His Honour Judge Tony Hunt to discuss "The Working Group to Identify and Report on Efficiencies in the Criminal Justice System of the Courts" Venue: Good World Chinese Restaurant, 18 South Great Georges Street, Dublin 2. Former Lord President Lord Hamilton, now of Qatar court. 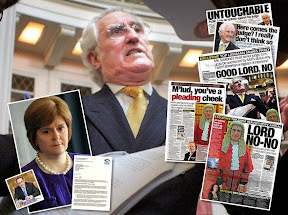 TRANSPARENCY has not always been the perceived sworn & deadly enemy of Scotland’s jet setting, boozing, partying, public-funds-cheating & tax-avoiding-island-hopping-bank-fiddling Judiciary of Scotland - as one former Lord President proved when confronted by journalists investigating the veil of secrecy around our ermine clad public servants. 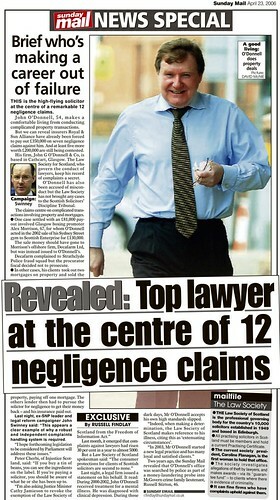 For the story of how Scotland’s judiciary finally surrendered details of their own cash splurging expenses claims – began with an investigation by Diary of Injustice during 2010 – prompting a decision by the then Lord President – Lord Arthur Hamilton – to publish judges expenses claims on a quarterly basis ever since. The task – to break the secrecy around how much public cash our judges were burning up for junkets here, there and everywhere – was admittedly difficult. 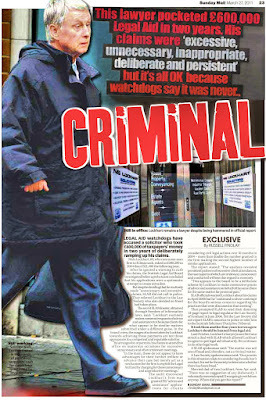 The Scottish Government – initially claimed they held no such figures - and none existed. 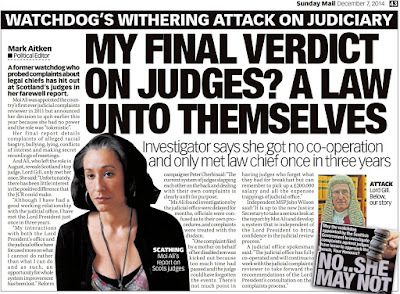 The same was true of the Scottish Courts Service – eager to keep the open wallet policy of throwing cash at the judiciary out of the headlines. 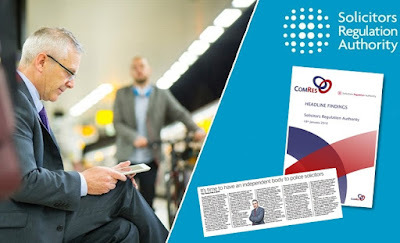 But, there was Freedom of Information – a tool to be used by all – media and public alike – to break the secrecy of our public institutions no matter how high up the ladder they regard themselves. 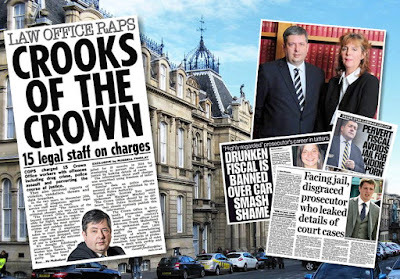 Compared to England & Wales – where the judiciary were required to publish their expenses claims and had done so for many years, going that little bit further in Scotland appeared almost impossible, with the resistance encountered from public bodies responsible for the figures. The more resistance, the more suspicion there was … something to hide. 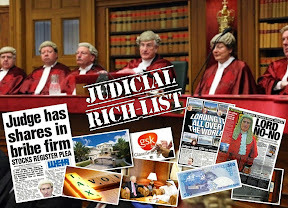 On top of judicial salaries in 2010 – around £6.1 million, the judges were topping up their positions with cumulative expenses claims of £200K. Admittedly perhaps not in the Westminster Parliament’s expenses fiddling league – but getting there – if left secretive and unchecked. 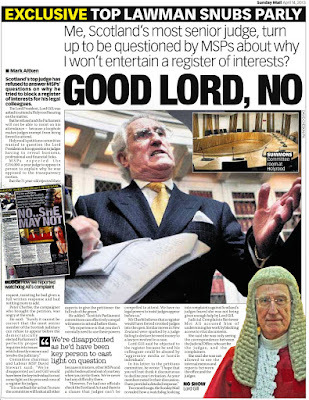 However, once told of the queries - Lord Hamilton – the top man - was having none of it - and the Scottish Courts Service were ordered to make the figures public on a rolling basis – every quarter. In one quarter alone this year – from 1 April to 31 June, our Court of Session Senators on salaries of up to £225K a year - claimed a whopping £17,331.57 extra in expenses. Lord Carloway – who is otherwise occupied in fighting proposals before the Scottish Parliament to create an even greater and more effective level of transparency – Petition PE1458: Register of Interests for members of Scotland's judiciary – claimed £1315.66 expenses in the last quarter available. Lady Dorrian – The Lord Justice Clerk – claimed a mere £338, Lady Smith - £176.55. Lady A Carmichael- £121. 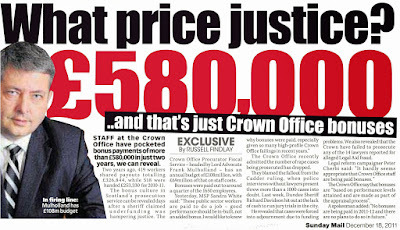 Lord Kinclaven claimed a whopping £6,195.35 – most of which falls under the heading of “accommodation and subsistence”. 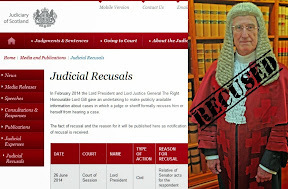 Lord Brailsford required £14.85 from the public purse – the same judge whose name appears on the title deeds of the Laigh Hall – as a “trustee” for the Faculty of Advocates who swiped it from public ownership. Lord Matthews claimed £308.70. 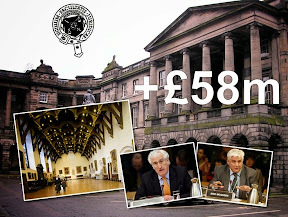 Lord Pentland claimed £385.86. Lady Stacey claimed £741.50. Lord Tyree claimed £490.52. Lord Stewart claimed £3,990.75. Lord Burns claimed £103.80.Lord Armstrong claimed £2,709.50. and Lady Rae claimed £439.53. Bringing a grand total of £17,331.57 for a mere three months work for a handful of judges. It’s a tough life being a Senator of the Court of Session. All that jet setting, sitting in court, gatherings with the legal crowd at taxpayers expense. resisting declaring their interests. 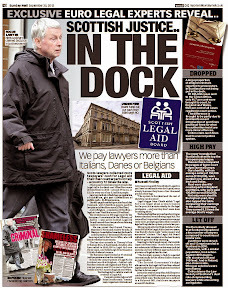 A tough life indeed – but at least Lord Hamilton allowed the media and the public the chance to peer a little deeper into how our cash flowed out on judicial jet set junkets and judicial expenses claims. Since retiring as Lord President, Lord Hamilton now serves on the supplementary panel of the United Kingdom Supreme Court (UKSC). Additionally, from April 2015 - the former Lord President now holds a position on the Qatar International Court and Dispute Resolution Centre – where big business can confront each other over – as the title suggests – disputes. The court is led by QIC President, The Rt. Hon. 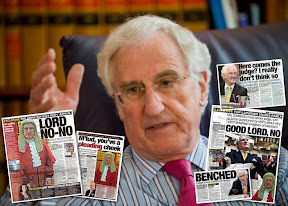 The Lord Phillips of Worth Matravers – former Lord Chief Justice of England and Wales who served as President of the Supreme Court of the UK from 2009 to 2012. Appointed along with Lord Hamilton was Edwin Glasgow QC from England, Gopal Subramaniam from India and Justice Laurence Li, a former supplementary judge of the Qatar International Court, from Hong Kong. The QIC comprises the QFC Civil and Commercial Court and the QFC Regulatory Tribunal established pursuant to QFC Law No 7 of 2005, as amended by QFC Law No 14 of 2009. The QIC has internationally renowned judges with expertise in complex commercial disputes and serves to uphold the rule of law, applying the highest quality international legal standards to civil and commercial disputes between individuals and business entities operating both in and outside the QFC. 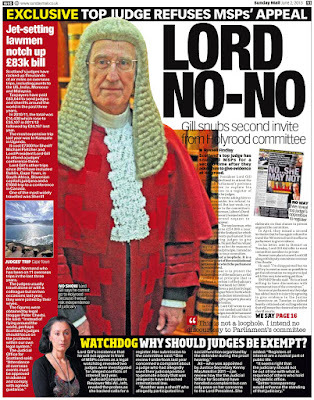 Readers will be familiar with Lord Brian Gill’s five day state visit to Qatar LORD JET SET: Scotland’s top judge Lord Gill takes 5 day STATE VISIT to Qatar as investigation reveals judiciary's international travel junkets spree.